The metal legends will perform in Montreal, Toronto, Edmonton and Vancouver as part of the band’s 2016 North American leg, which includes previously-revealed US dates. 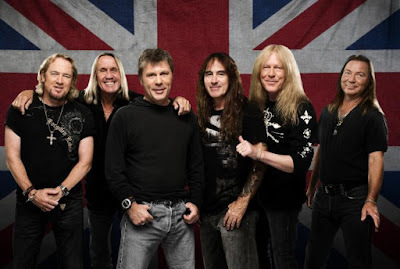 “We’re all excited to be coming back to Canada,” says frontman Bruce Dickinson. “Especially as this time we’ll be able to fly Ed Force One in to all four cities where we’re playing, not just Toronto which was the only way possible on the first Ed Force One tour in 2008. “We haven't decided on the set list as yet and won’t until we start rehearsing but we really look forward to playing a number of new songs live, especially as the recording was so much live. However, as it’s been a while since we saw you all, I am sure we will include plenty of older fan favourites too. I think the fans will be delighted by what we have in mind. The Iron Maiden Fan Club presale for the Canadian dates starts on October 13 and tickets go on sale to the general public on October 16. Beyond the North American shows, the group have unveiled Latin and South American concerts in March ahead of April shows in Australia and New Zealand. Previewed by the lead single “Speed Of Light”, “The Book Of Souls” debuted at No. 2 in Canada upon its release last month. Recorded in Paris in 2014, the band’s 16th album was produced by Kevin Shirley.